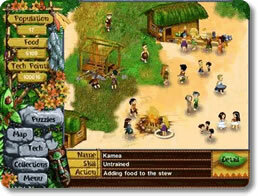 Virtual Villagers: The Lost Children Game Review - Download and Play Free Version! Uncover the secret of children living on the other side of the island! Difficulty settings and game speeds let you adjust the game to your style. The Exciting Sequel is Here! In the first Virtual Villagers, you helped a group of stranded islanders survive. Eventually, through scientific discovery, building, farming, and unlocking secrets, your people were able to open the secret cave and venture inside. What two of them found was quite a surprise! Virtual Villagers The Lost Children tells the story of how your villagers find a group of strange children on the other side of the island. It is up to them to train the children and unlock new secrets that will tell you more about the strange island you live on. Once again you must train your villagers by giving them different tasks to accomplish. As they work, they will gain skills as researchers, farmers, builders, doctors or parents. These skills will help them accomplish new tasks and unlock the secrets of the island. 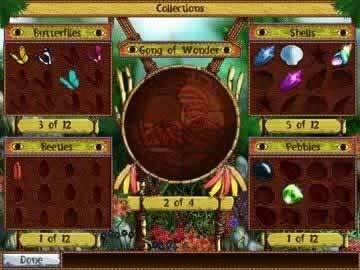 Virtual Villagers 2 adds some new things to find and accomplish. Children can find various collectibles around the island, you can buy outfits for your villagers once the sewing hut is created, and even build a hospital for the sick. There are many new surprises awaiting so download the free trial today! In Virtual Villagers: The Lost Children, you get to control the lives of your villagers and their children while you investigate the mysterious secret city. You are responsible for building shelter, gathering food, researching new technology and much more. The villagers will have to learn skills to gain healing skills and to solve other mysteries in the area. All this is going on in real time, even when you aren't playing. You start the game with a brief story about two villagers deciding to explore a mysterious cave. The two villagers enter the cave and shortly after slip into a river and are washed downstream and over a waterfall. They realize they are on the other side of the island in a native village, but the adults are strangely absent. Only the children are left and the two villagers take it upon themselves to help the children and do their best to raise them. Controlling the game is very simple and only requires the mouse. To start a villager on a certain action you hold down the left mouse button on them which will pick them up and drop them near the activity you want them to perform. Tech points and food are the only consumables in the game. Tech points are earned by scientists and can be used to upgrade things like medicine, engineering, exploration and even culture. Food is gathered or grown and feeds the villagers when they are hungry. While this game will entertain you for a long time, you can't play it for much more than half an hour continuously without getting bored. Since you only need to tell the villagers what to do and they will keep doing it, your interaction is fairly minimal. This game is best played in small bursts and then leaving things to progress while you are away. 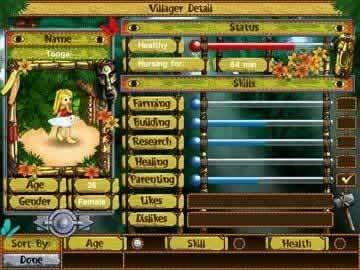 Overall Virtual Villagers: The Lost Children is a great game that will entertain you for a long long time. Playing in short bursts means you won't have to spend all your time playing and having things progress while the game is off makes it interesting. Easy controls and a family friendly theme makes this game playable by anyone. With plenty of upgrades and mysteries this game is well worth the time. Developer created video showing gameplay clips.